It is not often that I am given to superlatives. I drive hundreds of vehicles every year and it is easy to become jaded. In this kind of job, you grow quickly skeptical of the manufacturers’ hype and know when you are being snowed. That said, I was impressed and amazed at the 2016 Toyota Tacoma that I drove two weeks ago. I’ve been itching to write about it but was shackled by an embargo that just now has been lifted. And none too soon, since any longer delay just might have made my head explode. This is by far the most capable mid-size truck that I have ever driven, with state-of-the-industry features that make it a good value and a recommended buy if off-roading is part of your game plan. I’ve always been tough on the Toyota truck team for not going the extra mile, but with this Tacoma they went there and then some. That said, this segment is one of the fastest growing in the auto biz today. 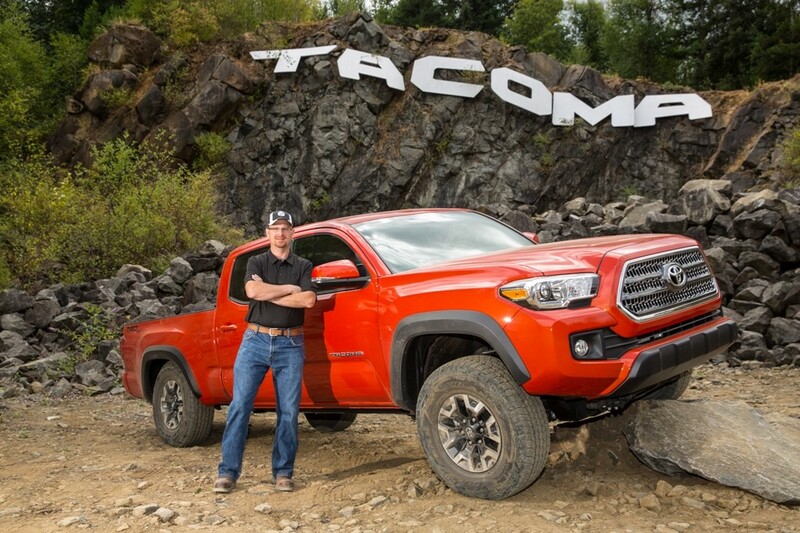 The Tacoma has owned the segment for years with more than 60% of market share. The Frontier has not had a major redesign in a decade and a scheduled new vehicle has been on the back burner while Nissan focuses on the new Titan with a diesel engine. The Chevy Colorado and GMC Canyon have shaken things up and are doing well. The introduction of a diesel option this fall will make the game even more interesting, and their trucks are extremely capable; but if you long for something that will take you into the wilderness and give you a sporty on-road drive you must check out the new Tacoma. The 2016 Tacoma is an entirely new truck for Toyota. It has an all-new powertrain and greatly improved suspension, improving the ride both on and off road. The Toyota engineering team at the Toyota Tech Center in Ann Arbor, MI, was the source for much of the development, according to Mike Sweers, chief engineer for the program. High strength steel was added to provide overall strength and rigidity. A new hot stamping process was used for the body shell, reducing weight at the same time. Two engines are available. The vehicles we drove were equipped with an all new V6 featuring a segment-first 3.5L Atkinson cycle with variable valve timing with intelligent wider intake (VVT-iW) which combines both direct and port fuel injection utilizing Toyota’s D-4S technology. This new engine offers 278 hp (42% more than the previous V6) and 265 lb.-ft. of torque. 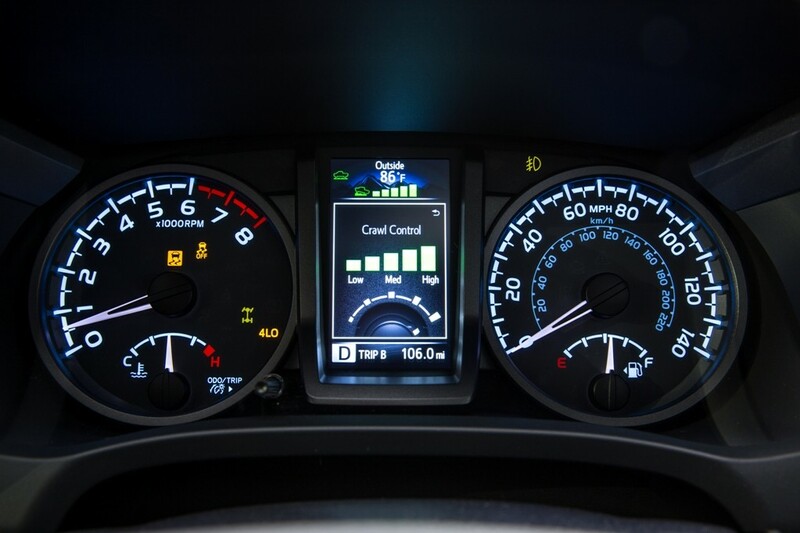 Fuel efficiency is an estimated 19 city/24 highway/21 combined for the 4×2, 17/21/19 for the manual crew cab and 18/23/20 for the automatic. The other engine is a 2.7L DOHC four cylinder with VVT-i that generates 159 hp and 180 lb.-ft. of torque. Fuel numbers for this engine are 19/23/21 for the 4×2, 19/21/20 for the manual and 19/22/20 for the automatic. The optional tow package for V6 models includes a Class IV towing receiver hitch with transmission cooler with water and air cooler, 130-amp alternator (on manual models), 4- and 7-pin connector and trailer-sway control. The Tacoma is wired for a brake controller and I understand that one will be available as a Toyota accessory, although others are already available through dealers or the aftermarket. 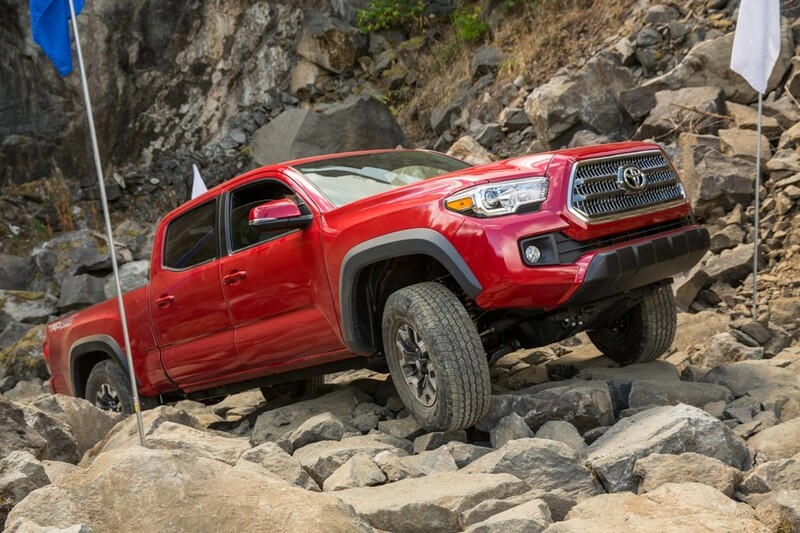 We put the V6-equipped Tacoma through its paces both on and off road. 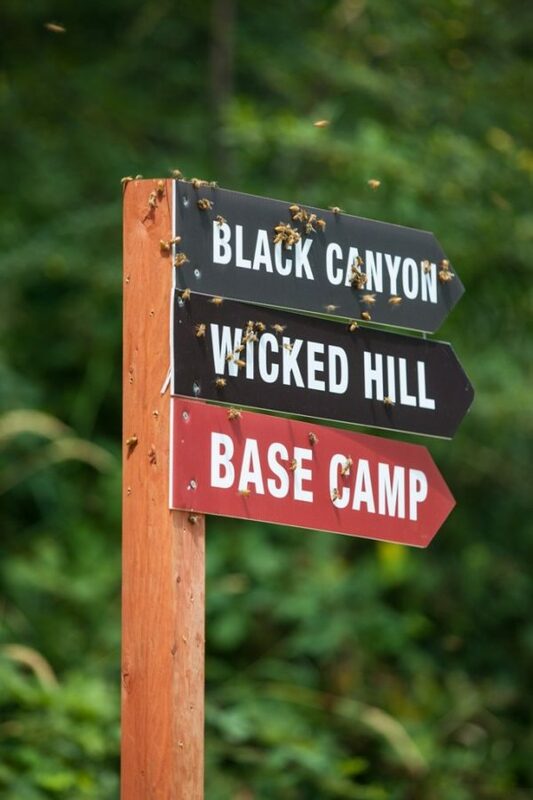 The off road track was made up of three separate exercises — a breath-stealing 40-degree double drop that was unusually challenging, a massive rock crawl and an unpaved trail course that was so narrow that trees had to be trimmed to make it passable. These were among the most ambitious that I’ve experienced with any manufacturer and this truck aced them all. On road, we drove from a location near Sea-Tac airport in Seattle to Snoqualmie Falls and on to the off-road site, then back to our Seattle-area hotel. It was a great vehicle and very suitable as a quiet, comfortable daily driver. Toyota also put the Tacoma through a very impressive activity where they buried the truck up to its wheel hubs in loose sand — the kind you often find on Texas beaches. In reverse, the driver was able to completely extricate the truck and drive out. This is not something I have seen done with other trucks, but it is a risky choice in front of two dozen auto journalists, and the Tacoma performed like a champ. 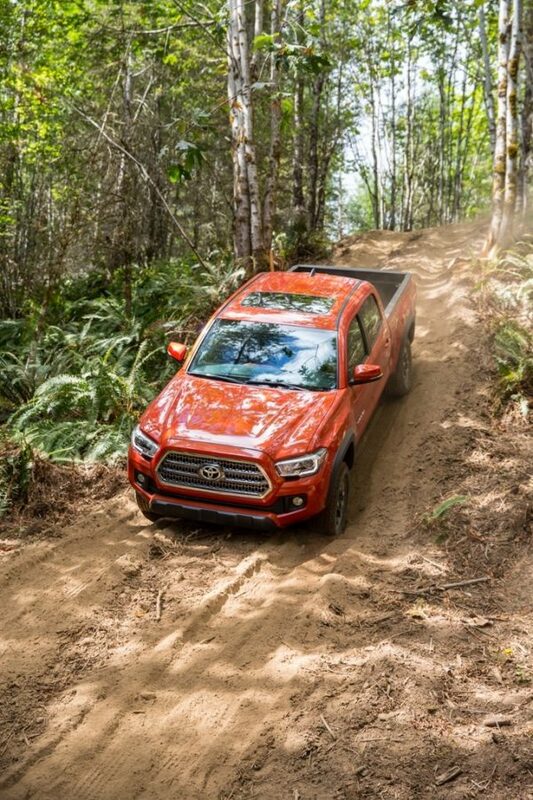 Two of the most extraordinary features on the 4X4 automatic versions of the new Tacoma are the multi-terrain select system which such as loose rock or mud and sand. Wheel spin is changed by adjusting the throttle and break pressure for maximum traction. Simply said, it does what it is supposed to do. More amazing was the crawl control which allows the driver to select a speed of 1 to 5 mph. The driver takes his foot off of both the brake and the accelerator and the system takes over for ascent and descent and crawling over massive boulders. The driver need only concentrate on steering. It is a marvel, even on our demanding off-road course. Other relevant features: locking rear differential, hill start assist, clutch start cancel for manual transmissions, and active traction control. Those who love the beefy look for the current Tacoma will be very comfortable with the 2016 version, but those who seek a more refine appearance will be delighted, too. 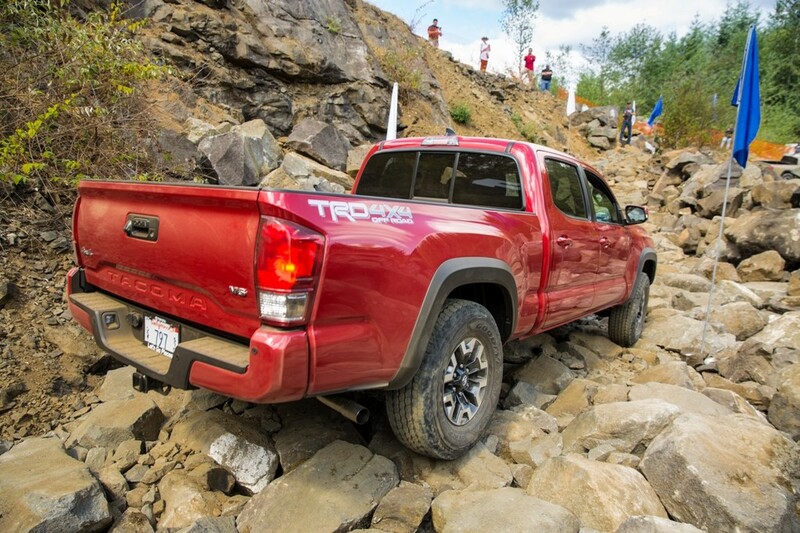 There is more chiseled styling and a new grille that marries the Tacoma to its Tundra stablemate. The styling team says that cues were taken from desert racing. Wheel flares are dramatic for better wheel travel and a high-lift appearance. There are four new wheel designs from 16″ to 18″. 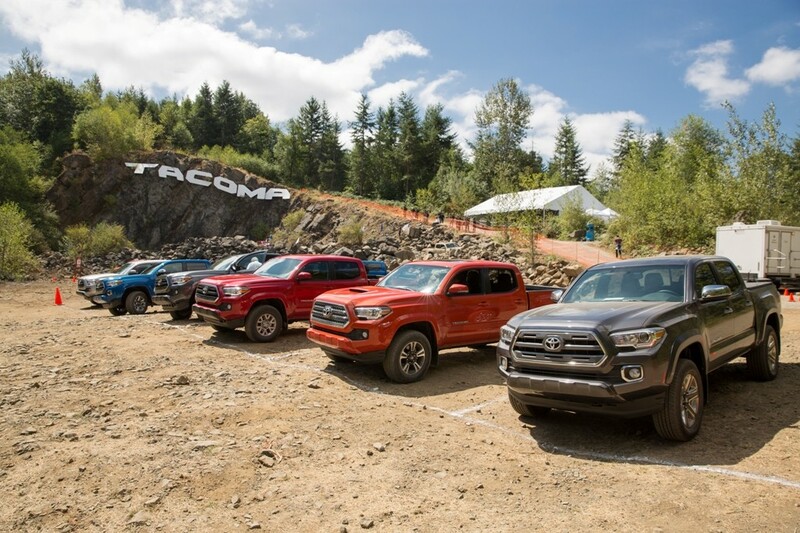 Tires were original equipment and, while I expected the rock crawl to require some changes, we never needed to change a tire — I’m told that the same was true for the other groups that tested out the Tacoma in the course of several weeks. The new hood and grille are more energetic and robust looking; headlamps are higher, sitting above the front bumper, and are available with LED daytime running lights. I recommend including these since they make a huge difference in bad weather. The locking tailgate has an integrated spoiler for better aerodynamics and an easy lowering feature prevents the slam that all truck owners hate. 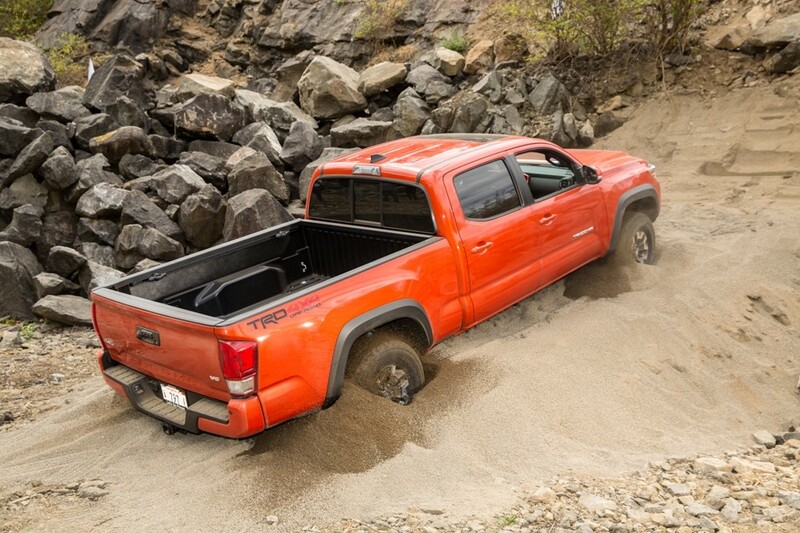 There is a Toyota-only composite truck bed standard, eliminating the need for a spray on or added bed liner. An available factory-installed tri-fold hard tonneau cover that offers a positive seal with no gaps. I have been generally unimpressed with the Tacoma’s interior in the past. It always seemed as though they missed the mark or figured that the rough-and-tumble owner didn’t care if it was uninspired. Not this time. The quality of the materials, fit and finish and premium features are all here. First and foremost, this is a very quiet interior that recognizes that a truck can be rugged and comfortable, too. All seals were beefed up and both an acoustic windshield and sound-absorbing headliner were added. Road noise, even under rough conditions, was very controlled. 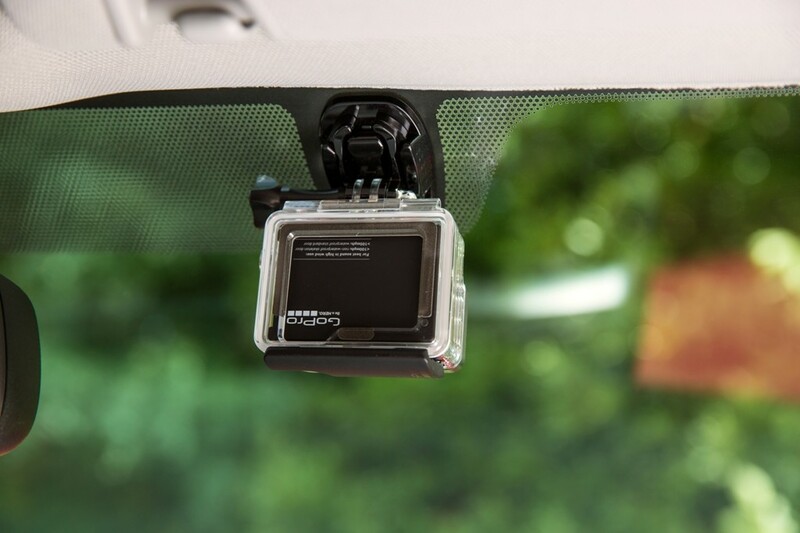 One interesting feature that is standard on all Tacomas is a GoPro mount located near the rear view mirror. I admit that, with our off road activities, it would have been great to see how it worked, but I will go on faith that it will stabilize the camera for award-winning shots. Among the available up;grades are Qi wireless charging, smart key with push button start, leather trimmed seats, power tilt/slide moonroof, dual zone climate control, upgraded audio and blind spot monitor with rear cross traffic alert. There are five grades and 29 configurations offered and all will be offered in 4×2 and 4×4. The grades, each with its own personality are the SR, described as work ready; the SR5; the TRD Sport; the more muscular TRD Off Road; and the Linited. Knowing the Tacoma aficionado, I expect the most action in the TRD versions, but the base model is likely to be a popular work truck at a nice entry-level price. I won’t go into color choices or accessories except to say that they are more extensive than ever. Entune audio system is standard on the SR, an upgrade is standard on the SR5. 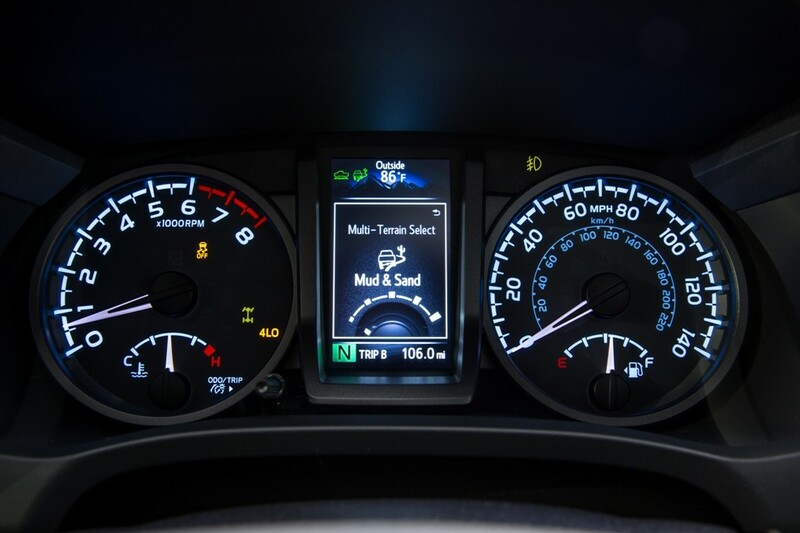 The TRD Sport and Off-Road grades are upgraded yet again with even more features and integrated navigation. The Limited features Entune with a JBL audio system featuring six speakers and a subwoofer. There are nine core packages for personalizing the Tacoma, so you can really make this truck your own. With so many choices, I’ll just provide the basics when it comes to pricing. The 2016 Tacoma ranges for $23,300 for the base SR access cab with the 2.7L engine and six-speed transmission to $34,745 for the Double Cab Limited with the top-of-the-line engine, six speed automatic transmission and lots of bells and whistles. A comparably outfitted 1/2-ton would be almost double that, and the Tacoma fits in most garages. The 2016 Tacoma will be entered in the Texas Auto Writers Truck Rodeo in October and I should have even more driving impressions then. The off-road course won’t be as demanding or my on-road drive as long, but this will be a good opportunity to get behind the wheel again, and I am looking forward to that.